Until very recently, The Dukes of Sandwich food truck was a familiar sight around Christchurch, but lucky old Wellington is the owner-operators’ new home. Laura and Rob trained as chefs. Both had the same goal of using their culinary skills to travel the world. Having met in Melbourne they ended up eating their way around the world for most of the next five years and delving into a bit of permaculture along the way. During this adventure the idea of having a food business that could supply its own produce took shape in their minds. 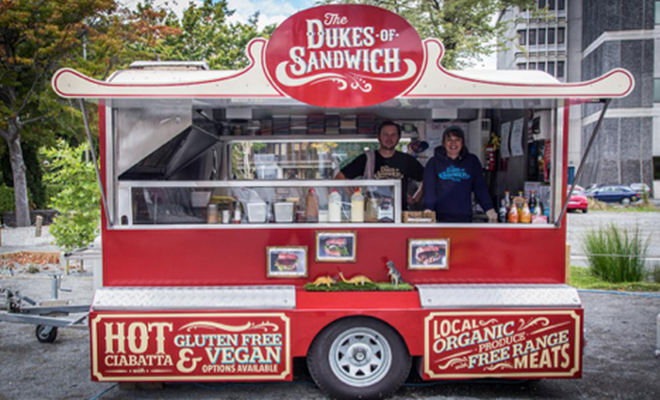 On their return to NZ they still weren’t 100 per cent sure where they would end up and, after their gypsy lifestyle, it made perfect sense to put their first business, The Dukes of Sandwich, on wheels! They also set about learning how to run a business effectively and grow produce on a scale large enough to keep up with demand. Laura did a lot of research and found a free organic horticulture course at the Biological Husbandry Unit (BHU), based at Lincoln. “Feeding people good food and supporting local providers feels pretty rewarding,” says Rob. The Dukes’ food is fresh, ethical and supportive of locals: definitely not lacking in flavour or love. One of their popular offerings is the pork sandwich: free-farmed pork belly rubbed with gunpowder seasoning and served with apple and fennel slaw and bourbon-barbeque sauce on ciabatta. Their vegan menu is also popular: “People appreciate that you provide a vegan option, and ours is really good! It’s a burger made with mushrooms, nuts and grains with a vegan aioli, ’slaw and our famous beetroot chutney,” says Laura. The Dukes hope that the DreamCatcher Food Co-op will be able to supply them with some nourishing veggies, for starters, but equally as important for them is the chance to join a like-minded community.